Facebook, Uber and AirBnB have single handedly changed modern day culture. Facebook made it possible for people to express themselves in a very calculated way, highlighting only the things they feel are worth sharing. Dare I say it? Your social worth is determined by the number of followers, likes, views and shares. Hey! Don’t hate me hate the game. I hate it just as much as you do; I won’t pretend like I haven’t thought of a million ways to beef up my 961 IG followers. To be honest, I’m just too lazy, too self-conscious and too cheap to do what it takes to get the big numbers. I’ll explain that last sentence later, or maybe I won’t hehe! Seriously, here’s what these numbers really do, they subconsciously motivate people to find bigger and better things to post. According to CNBC, “a study by Harris Group, found that 72 percent of millennials prefer to spend more money on experiences than material things like homes and cars.” Eventbrite’s research of millennials concluded that this generation highly values experiences and will continue to increase their spend on events, concerts, festivals, cultural experiences and traveling. Consumer brands that don’t recognize and embrace this shift will consequently miss out on the estimated $1.3 trillion in annual consumer spending among millennials alone!!! Wisely there are brands like 103 Collection, a vegan hair, skin and beard care product company that focuses on consumer engagement to make the sale. CHOP CHOP recently partnered with 103 Collection to host a Beards & Love Tour. 103 Collection has seen tremendous growth within their beard care product assortment and continue to look for ways to grow. They identified professional, millennial, African American men as a target audience. Rather than simply run ads targeting this group, the company identified the power of this group’s social influence. Melinda Herron, HWIC (Head Woman In Charge) and CEO of 103 Collection came up with the idea of orchestrating a Beards & Love Tour. Simply, genius! Allowing, sophisticated, swaggalicious (can I say that?!?! ), black men to lead a panel discussion on love and relationships would certainly draw not just a crowd, but the right crowd. The room was filled with not just African American men with and without beards but LOTS of African American women, eager to hear what these men had to say. Since 103 Collection’s products also cater to women with curly, textured natural hair the event drew a number of potential consumers for the brand. Over the past 3 years building CHOP CHOP, one thing is for certain, the mobile salon has proven to be “share” worthy. When Melinda approached me about the idea I was totally onboard. CHOP CHOP’s mobile salon would be the perfect platform to demo their products. With bright lights, mirrors, comfortable seating, music and an intimate innovative space, it was the perfect vehicle (pun intended) for trial, demos and sampling. 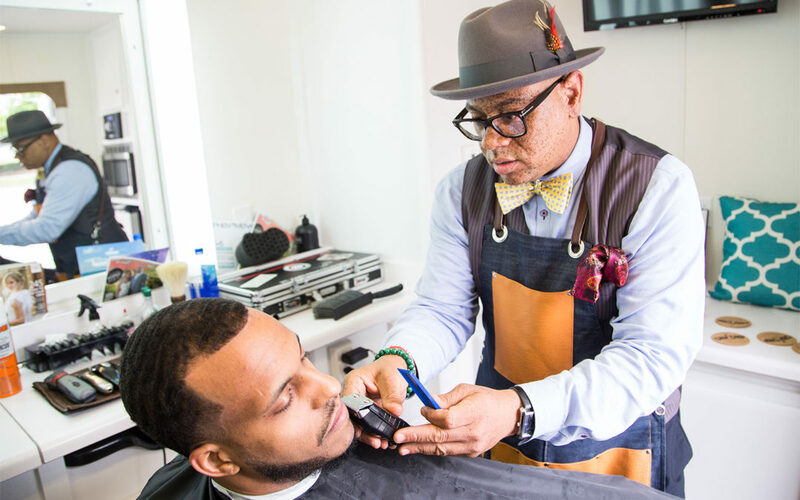 In addition, men were able to receive fresh haircuts, lineups and beard trims, as well. Talk about relevant and convenient! Honestly, we went to Houston with no expectations, just with a lot of hope that our master plan would materialize the way Melinda and I had envisioned. It’s now been two days since the event and what have we seen, product sales? Nope! Not one, not yet and that’s okay. We gave attendees swag bags with free samples of hair and beard care products from 103 Collection and body scrub from CHOP CHOP’s AaLov spa product line. We did this knowing that once the attendees try the products they’ll go online and order product at a later time. What we have seen over the last two days are posts and videos from those that attended the Houston Beards & Love event. We’ve been tagged in over 30 photos and videos, gained new followers and built personal relationships with potential customers. We left a positive lasting impression on our audience. What experiential marketing does is it creates a happy fan, the fan then becomes an influencer and then does the marketing for you. My advice for Brand and Marketing Managers, looking to generate awareness and build equity, don’t get caught up chasing sales. Have a clear vision of what you want to achieve and what success looks like, create the experience, execute and trust the process. For more on our mobile tour capabilities, email info@chopchopmobile.com and speak with a project manager to discuss your next promotional tour.